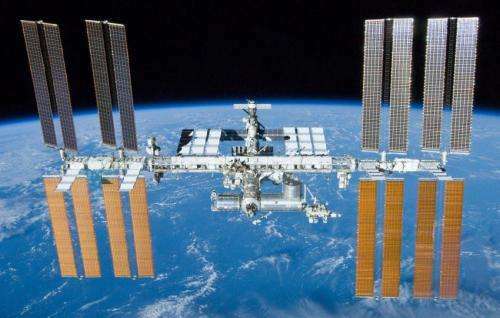 The Russian news agency ITAR-TASS is claiming that Russian officials have confirmed that Russian cosmonauts have found sea plankton on the outside of the International Space Station. The news agency reports that the cosmonauts have also found traces of other organisms on the outside of the station as well. To date, no other news group has been able to confirm the report and thus far it appears no other agency, including NASA has been able to confirm the claims made by the Russians. Finding sea plankton on the outside of the ISS would be remarkable, as the outside of the station is of course exposed to space—a hostile environment, to say the least. NASA officials reported that they were aware that Russian cosmonauts were conducting experiments on the exterior of the space station (primarily on windows known as illuminators), but were unaware of what they entailed. They note that cosmonauts have conducted such experiments as recently as this past week. The same officials report that they have not heard the results of any findings regarding the experiments from the Russian scientists directly, and thus, cannot comment on what the Russians are claiming. One scientist with NASA, Lynn Rothschild, suggested that if the claims turn out to be true, the plankton likely made its way to the ISS aboard a space station module. Reports of the sea plankton findings have come, ITAR-TASS reports, from Vladimir Solovyev, chief of the Russian ISS orbital mission—he's also reporting that the type of plankton found is not native to the parts of Russia where spacecraft are launched—he theorizes that air currents could have pushed the plankton to the station (plankton is known to make its way into the atmosphere). The findings, he continues, confirm that organisms can live on the outer surface of the space station, something Russian scientists have apparently been studying for over a year—though he didn't actually come right out and say that the specimens found were still alive. He also reports that the outside of the space station is covered with material from spacecraft engines that is emitted as they come and go. Of concern are the illuminators, which now need to be polished. It's raw data. Ignoring or dismissing it will never lead to an explanation. Are the windows facing Earth or out to deep space? Perhaps on the Earth facing side the UV is not enough to fry the organisms. Air streams can transport Plankton almost anywhere, although typically in small quantities. Some traces could be stuck to that window even before the module was launch. Cape Canaveral is permanently exposed to sea-breezes, so you'd think the surfaces of anything that sits there waiting to be launched is going to collect some. Also when shuttles docked with the ISS, any venting from the pressurised adapter might have moved some of that material. Isn't a bit concerning that ISS staff were kept in the dark about what the russians were doing outside? What a weird, passive-aggressive article and if the source of the this article was the "conveniently" placed link then inaccurate as well. Hold your horses. That anything would live in space is an extraordinary claim needing extraordinary evidence. But we don't even have ordinary evidence. It is a single source russian news agency claim, not a peer reviewed science find! For one thing, it doesn't seem they have used a null hypothesis with reference samples, meaning the algae could be from the wipes out of their package, the humid and dirty ISS innards, and especially whatever analysis equipment they have used to study single cellular life already. This is, so far, a non-find. @Landrew: There isn't any data as of yet, just a badly supported rumor. You will have to wait and see if there will be any well defined observation as per above before there is anything to explain. @animah: Why would the US ISS staff be more concerned with what is going on on the russian side than the Russian ISS staff is for the US side? And if there is a science or technology development project, there should be a lot of competition as usual. Next we will hear of space barnacles and space toredo worms. However, deeper concern is here is visible proof that life can exist and thrive in space. Extend that and life has proven itself possible everywhere in space. Anywhere there is a possible energy transfer mechanism or imbalance by any means, anaerobic and sometimes not, at whatever range of temperature, life is possible. Earthcentric scholasticism is going to be relegated to the dustbin of history. No proof yet, just an unverified media story. Absolutely no proof life is possible "everywhere" in space. The real news here isn't that life was found in outer space, but rather that life could exist in outer space. How it got there is another story. The most likely scenario is that rockets have to travel through the atmosphere to get to space and as they travel through the air, they pick up bits and pieces of whatever is in our atmosphere: microbes, plankton, dust mites, etc. No one thought that plankton could survive in space but now that we know, is it just existing or is it growing and multiplying? If it is growing or multiplying then what is it feeding off of? Solar cells? That wouldn't be good. The bigger problem for NASA now is how do you know when you visit "sterile" other worlds like Mars or the up-and-coming probe to Enceladus, that you won't contaminate with an "invasive species" from Earth? Afterwards, if you do find life, how do you know you didn't put it there on accident? Better cancel that search for life, NASA.